Jorginho got his Chelsea career off to a great start this afternoon, after the Italian scored a very calm penalty to give his side a 2-0 lead against Huddersfield. The midfielder was allowed to slot home from the spot after Marcos Alonso was fouled in the area just before he was about to take a shot on goal. The former Napoli man will be delighted with this, as getting him name on the scoresheet so early on in his Chelsea career will definitely help him get the fans on his side. 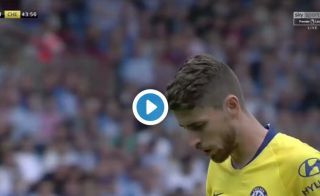 Here’s a clip of Jorginho’s spot kick today. Cool as a cucumber.